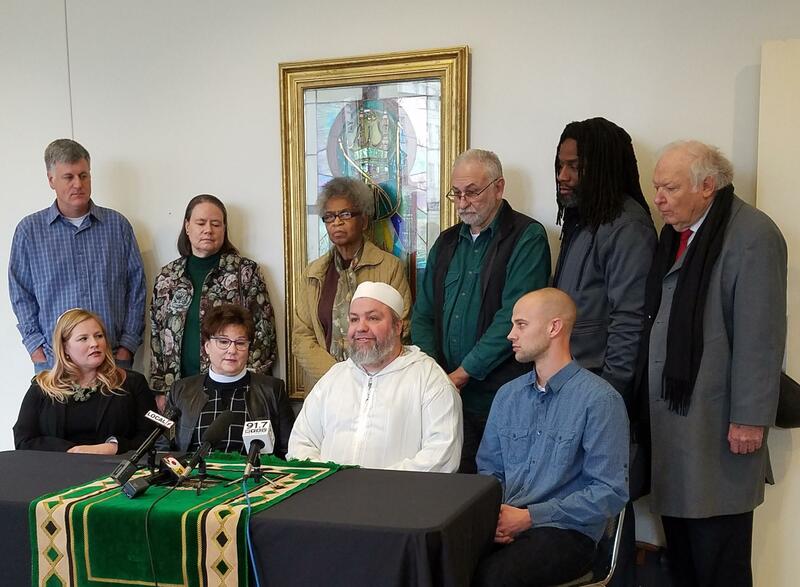 Members and supporters of the Cincinnati Sanctuary Network announce the first member congregations Jan. 18 at the Clifton Mosque. Two faith communities are ready to shelter immigrants and others under threat of deportation. Some 20 others are in the process of joining them or will serve as supporters. The Clifton Mosque and Christ Church Cathedral say they are prepared to house anyone who is facing what they're calling "unjust deportations" such as those who would be sent back to war zones. The Cincinnati Sanctuary Network notes the sanctuary movement has been around for a long time, but gained renewed momentum following talk of mass deportations and a Muslim registry during the 2016 presidential election. The Clifton Mosque was the first congregation to commit to the program "because there are things that are just morally and ethically right," says Imam Ismaeel Chartier. He points to the Underground Railroad and Muslims in Northern Africa sheltering Jews during World War II as similar examples. "We will stand with everybody else and support our brothers and sisters in humanity regardless of their national identity or if they're documented or undocumented. If they're in any kind of struggle for their humanity we will stand with them, behind them, in front of them, and we will demand their rights." Dean Gail Greenwell of Christ Church Cathedral says this isn't in response "specifically to partisan politics. But the recent political climate and the increased incidents of hate speech and violence have caused legitimate concern within members of our community in their fear for their personal safety. We feel that we must respond proactively while praying that our leaders will legislate compassionately." The mosque owns a home on its property and the cathedral has an apartment in its downtown complex. Other congregations will provide supports such as food, clothing, and legal aid. Member groups say they will vet those seeking shelter. They're planning training events for congregation members. The group says they've considered the legal ramifications and they're willing to take the risk. As for dealing with immigration officials, Greenwell says, "There is no legal precedent in this country for harboring individuals, but there has been a long history of the immigration service creating sensitive areas... schools, hospitals, churches where people would not be questioned, detained, or arrested." Temple Sholom, Clifton United Methodist, and University Christian Church are the first three to sign on as Solidarity Congregations. "The way that we live out the flesh of our tradition is through social justice, through caring for other people," says Rabbi Miriam Terlinchamp of Temple Sholom. "Whether it's the Torah or the Bible or the Koran, we all believe that we are created the same. This is a human issue, not a partisan issue. We're unified in caring for one another."